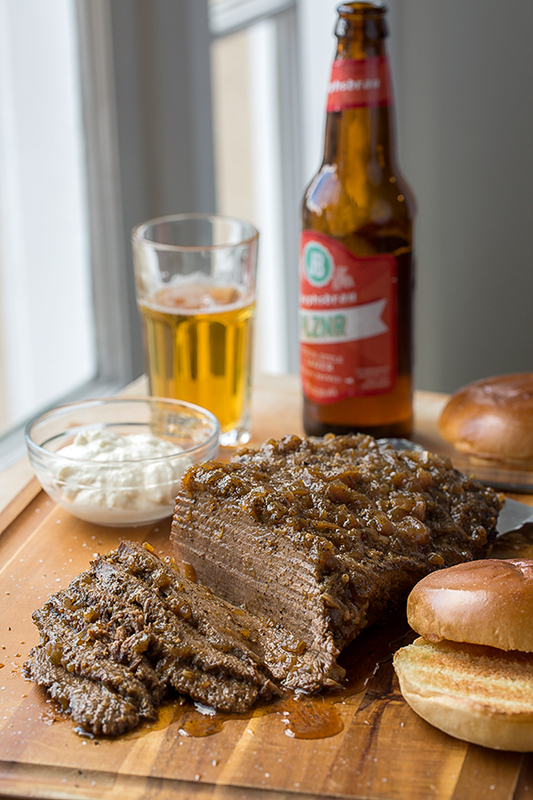 A meaty and juicy beer-braised beef brisket sandwich satisfies and nourishes the hungry soul to its core the way that the amazing and brilliant treasure that has been placed within each and every one of us can enrich and uplift others around us, if it is brought to light, refined, and shared. I love to go walking. It’s one of my absolute favorite ways to spend time when I’m looking to either clear my head, or use the rhythm of my steps to sort of “lull” me and allow whatever free-flow thoughts or even questions that might be hanging around in the nooks and crannies of my mind to impishly enter in and develop, if they’d like. And I always find it interesting the thoughts or questions that a simple, afternoon walk can inspire. A few days back, I felt compelled to go out to walk the three-mile loop at a well-known local recreational area and breath in the cool, fresh air in the late afternoon sun, that especially golden and inviting light that is completely unique to the afternoons in mid to late fall. And at about half-way around, I passed an older gentleman; I’d say he could’ve been in his late 60’s to early 70’s, and for some reason, he caught my attention. Perhaps it was the way he was walking, very slowly and deliberately, with his hands clasped behind his back, sort of carefully lifting his eyes from the ground to his surroundings, and then back to the ground to insure his footing was alright. For some reason, there was something about this particular gentleman that got me thinking and considering our lives in this physical realm, and how relatively short a period of time we actually have here on earth before our time is up in this manifestation. Is it so we won’t take one moment for granted? Is it so we feel compelled to do something meaningful, and to not have a single day be wasted? I suspect that the answer to both is yes. There is so very much that each of us can offer up to the rest of the world, and the “work” that we’ve been entrusted with here is to find out exactly what that is. Each of us have been imbued with gifts, talents, understandings, perspectives—something to share with others to make this existence a more positive, enriching and meaningful one for everyone involved. We all have something we can share, or we can teach; something that we can somehow inspire or encourage others with. And these are our precious gifts. These are the treasures that have been placed within each one of us, not to be hidden in the darkness, but to be held up in the light, and exposed—used for the positive, to help one another along on this journey we all share. They are meant to be sought out and to be understood, and to be multiplied and grown larger, not dampened or snuffed out in darkness and unconsciousness. Wouldn’t it be a loss, not only for one’s self but for others, to never have gotten to know the unique gifts—the treasures—that reside deep within that could be of benefit to all? It would be an unthinkable waste. I see that this human experience that we’re having is meant to be a shared one; one where what I’ve been given is not meant to stay only with me, but to be offered up as a blessing for others to have and taste as well. That the treasure, the “gold” within, is meant to make others lives more abundant and rich also, not only mine. Can you imagine a world like that? I believe it is the world our Creator, indeed, imagined for us, and knows we could exist in, if we begin to see that which we have within us as the blessing that it is. And so what I really began considering when I passed that older gentleman on my afternoon walk was this: have I dug deep enough to bring my personal gifts to the surface for others to partake in? What kind of stewart have I been with what has been given to me? Have I been consciously attempting to grow and expand—multiply— the treasure that I’ve been endowed with (bringing it into the light), or have I remained blissfully ignorant of it, or kept it mainly to myself (kept it in the dark)? We each have the responsibility to ask ourselves these questions. See, life is meant to feel urgent, special, and sacred. The time we have is meant to be used in a way that glorifies life and inspires contemplation and questioning so that we may gain deeper understanding of who we are, and what we are here to do. We’re not meant to live in the dark. What each and every one of us has within is a treasure to be displayed and given freely away. So now the question is: what will you do with the amazing treasure that has been placed within you? -Preheat the oven to 325°. 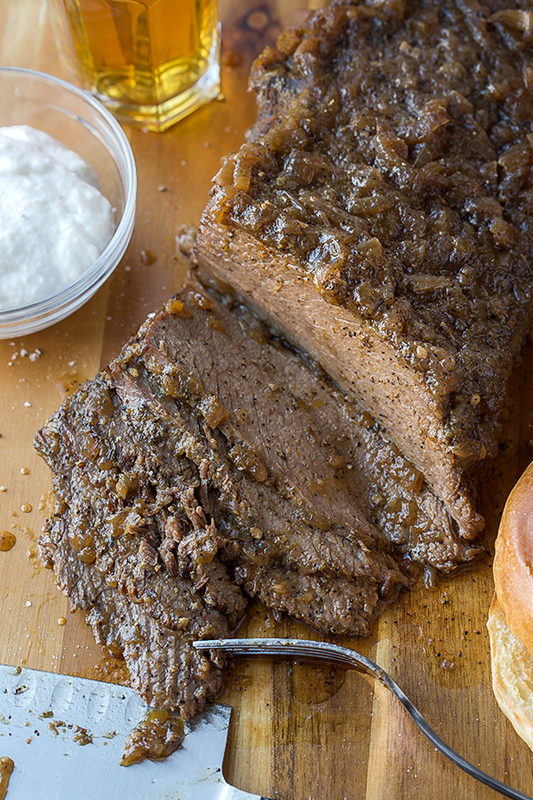 -Season the brisket well with salt (about 2 ½ – 3 teaspoons worth) and black pepper. -Place a large braising pan or Dutch oven over medium-high to high heat, and drizzle in about 4 tablespoons of the canola oil; once the oil is hot, add the brisket in and sear for about 4 minutes on each side; remove from pan and set aside. -Reduce the heat under the pan to medium-low, and add in the onions; add in the Italian seasoning, plus a sprinkle of salt and pepper, and saute them for about 6 minutes, scraping up the brown bits on the bottom of the pan. 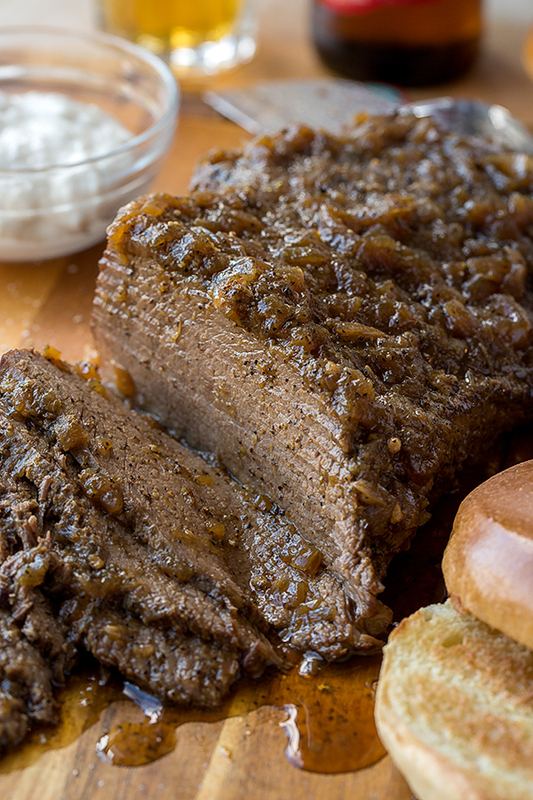 -Remove the braise from the oven, and allow it cool for at least 30 minutes (you can also make this ahead and allow the brisket to completely cool in its braising liquid, and then slice it up the next day for extra flavor, and gently reheat). -Slice the meat very thinly with a sharp knife, against the grain; place onto a platter. 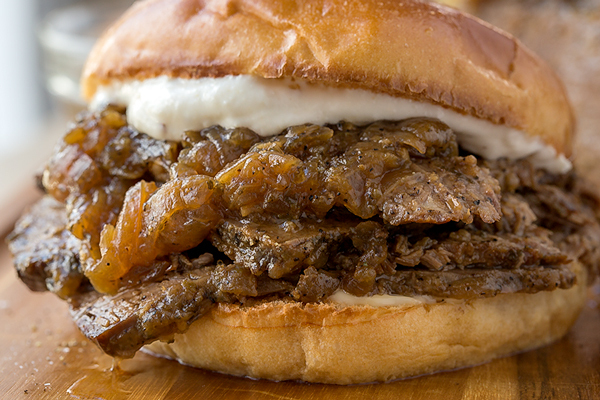 -Strain the onions from the cooking liquid, and reserve both the onions and the liquid; add the onions on top of the sliced meat, and set the strained juices aside for a moment. 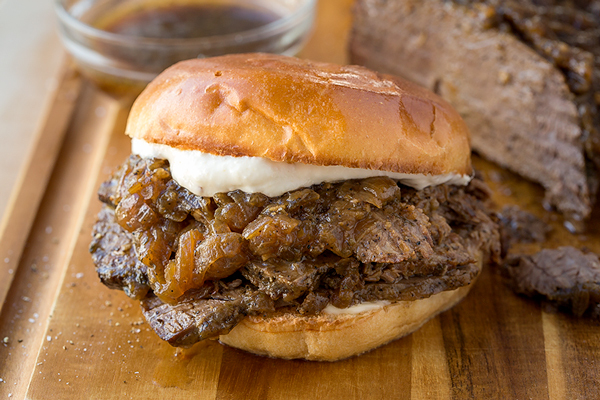 -Add a thin layer of mayo to your toasted buns, if desired, then add some of the sliced brisket and onions, and slather on some of the Creamy Horseradish Sauce; serve with a little of the warm, reserved juices that you strained, as the “jus” to dip the sandwich in, if desired. -Mix all ingredients together in a bowl until well-combined; use immediately, or keep any unused portion in the fridge, covered. Thank you so much for the recipe and your inspiring words. They really made me stop and think and want to pass your words on to others in my family as a mother of 4 and grandma of 4. So many think the only thing to share is of material things and in the end we realize it is more of human intervention that really is of importance. Such a blessing to have this in the early years of life and to continue until the end. I thought opening up this page I would receive just a wonderful recipe for food, but you also gave me one for life. Thank you ….. Being from the south we smoke briskets. Your recipe sounds great and I guareetee you I’ll try it. That said I have to ask where in the world do you find a 2.5lb brisket and why even bother when it’s going to lose have of that in the cook? There’s a whole lot of energy being used to cook this great sounding dish, go for broke and cook at least a 5-6 pound flat. I’m going to bet you wish you had. At any rate, thanks for sharing. Hi Carl, I so appreciate your comment! 🙂 You know what, I’m not sure if it’s because it’s braised or what, but though it did shrink a little during the cooking, it didn’t lose that much; and so it ended up still being a good amount of meat perfect to make these 4-6 sandwiches! But here’s what I’d say: for sure go for bigger if you’re looking to be able to make more sandwiches, or to have a couple days of leftovers! Why not? 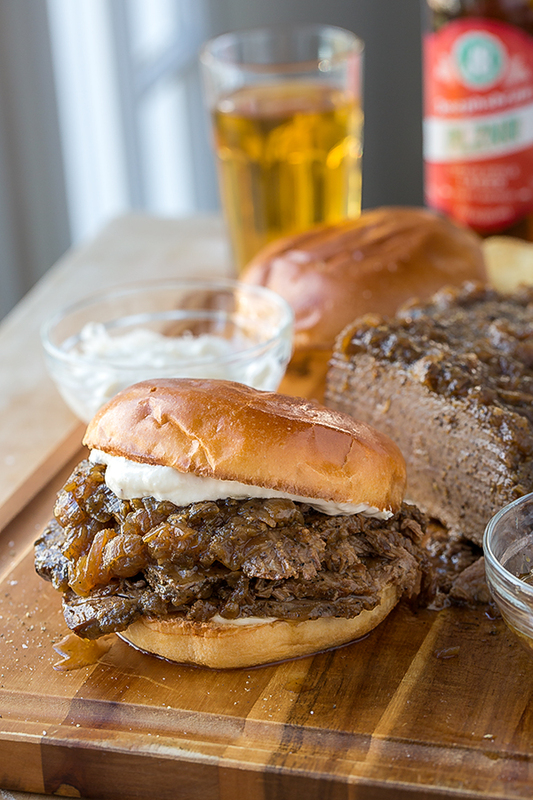 I bet your smoked version is absolutely delicious—and I’m honored that you’d consider trying out my recipe for the beer-braised; if you do, I think you’ll enjoy it! Thanks for stopping by! Do you think you could make this in the slow cooker? Hi Sara, I don’t see why not! I’m not very familiar with using slow cookers, so I don’t have specific info in regards to the recipe; but it is a slow-cooking piece of meat, so I’d say sear it off first, and just allow it to go on low (most likely) for a while. I just did one in the Slow Cooker came out great! Wonderful, Linda! Thanks for sharing that! This was a very enjoyable and easy recipe to prepare. The horseradish cream sauce was amazing as well! Only thing is I think I should have taken the brisket out of the liquid to cool for 30 minutes because it was still really hot and I couldn’t slice it at all! It shredded up which was fine, also after I strained the onions I reduced the sauce added some salt pepper and onion powder, and a cornstarch slurry to slightly thicken it up. On toasted brioche buns, this was an amazing sandwich! Thanks for the recipe! I’ll make it again for certain. 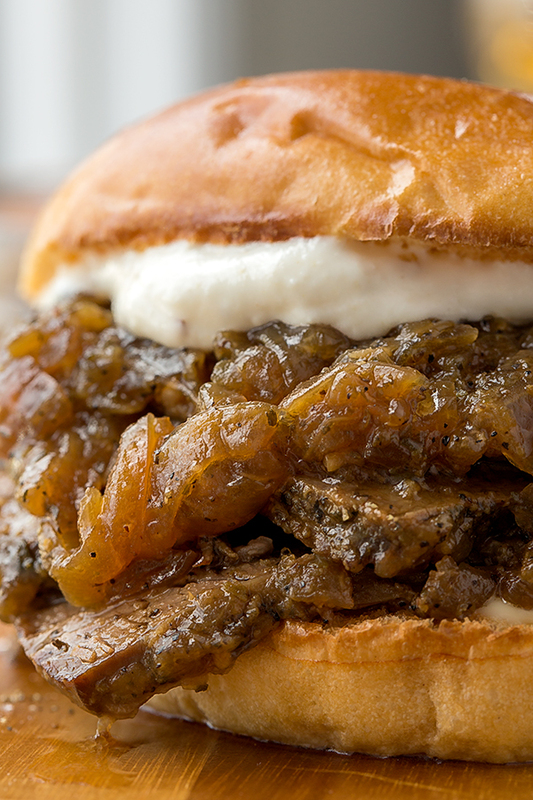 Hi Dave, thanks for commenting on your experience —so glad you enjoyed this recipe! (And yes, waiting the 30 minutes after the meat has braised definitely helps in the slicing, but I know it’s not easy, lol 😉).